There’s a lot of gear out there for your Apple devices, but how do you know which are worth your time and what’s not worth your money? In our Gear We Love column, Macworld’s editors tell you about the products we’re personally using—and loving. Though I’ve found a number of iPad mini cases, of varying levels of protection, worth recommending, I’m a minimalist when it comes to cases for my own iPad mini. Having broken an iPad screen in the past, I want some protection, but I don’t want a chunky case that spoils the mini’s svelte and lightweight design. Up until recently, that’s meant a combination of Apple’s iPad mini Smart Cover and SwitchEasy’s $20 CoverBuddy for iPad mini. The Smart Cover alone is flawed, but when combined with the CoverBuddy—a thin, protective shell for the back of the iPad that fits perfectly with the Smart Cover—you get a nice “case” that’s protective without adding a lot of bulk, and you can easily remove the magnetically attached Smart Cover when, say, you’re reading an ebook in bed. But one of my complaints about this combination is that I’ve never been completely happy with the Smart Cover as a stand. When propping up the iPad for screen viewing or onscreen typing, the Cover offers only a couple angles, and it never feels sturdy. A few months back, I started testing ZeroChroma’s Vario-SC Mini, a CoverBuddy-like case with a built-in stand, and it’s been on my iPad ever since. Like the CoverBuddy, the Vario-SC Mini is a shell that fits on the back of your iPad mini, covering its back and sides, with an opening along the left edge for the Smart Cover’s magnetic hinge. But the Vario-SC Mini is considerably more protective: It’s slightly thicker; the TPU material is a bit spongier to absorb more impact; and the case’s edges extend a bit farther around the front of the iPad to offer some protection if you place the iPad mini face-down. The case is also easier to grip, and it’s more scratch resistant—after several months of daily use, the only minor blemishes are on the stand part of the case, which is made of a more-rigid plastic. But it’s that stand that makes the Vario-SC Mini unique. On the back of the case is a rotating disc that hosts a fold-out, plastic stand. The stand’s leg has 10 positions (in addition to the collapsed-flush position), from roughly 30 degrees from the case’s body to roughly 120 degrees. Because the entire disc rotates 360 degrees, you can use any of these stand positions in both landscape and portrait orientations. Though the stand will fold up if you press firmly on the iPad’s screen, it’s sturdy enough for most uses, including onscreen typing. And if you use it in combination with the Smart Cover, the stand even works on your lap—the Smart Cover acts as a flat base for the leg to rest on. 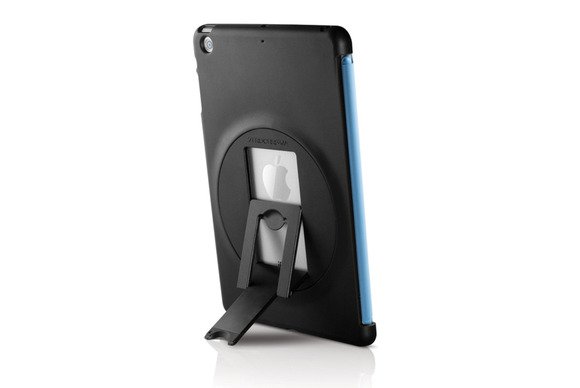 The case provides all the appropriate cutouts for accessing the iPad mini’s buttons, switches, and Lightning-connector port (though the Lightning-connector-port opening may not accommodate some third-party cables with bulky plugs), and it doesn’t obscure the iPad’s microphones, speakers, or back camera. It’s also easy to quickly remove the case if you want to temporarily go ultralight. The Vario-SC Mini does have a few drawbacks. Unlike the CoverBuddy, which comes in a range of colors, each perfectly matching its corresponding Smart Cover, the Vario-SC Mini is available only in black. More significantly, the Vario-SC Mini is bulkier than the CoverBuddy: It’s slightly thicker—mainly around the stand ring, because of the necessary extra plastic—and it weighs 4.5 ounces, compared to 1.6 ounces for the CoverBuddy. But with that extra bulk comes a good deal more protection and an excellent stand. If you’ve already got Apple’s Smart Cover for your iPad mini, but you want a bit more protection, you should consider the Vario-SC Mini before you toss out your Smart Cover and shop for a completely new case. And you can ignore the Vario-SC Mini’s $50 MSRP—it’s available from Amazon, for example, for around $30.